Supreme Court rules: banned band no more! Matal v. Tam. The Becket Fund for Religious Liberty (n.d.). Retrieved from https://www.becketlaw.org/case/matal-v-tam/. Matal v. Tam. (Apr. 04, 2019). https://www.becketlaw.org/case/matal-v-tam/. "Matal v. Tam." The Becket Fund for Religious Liberty. Accessed [Apr. 04, 2019]. https://www.becketlaw.org/case/matal-v-tam/. What do a Jewish-owned clothing line called “Heeb,” an Asian American rock band called “The Slants,” and the Washington Redskins have in common? The U.S. government says they are too “disparaging” to receive trademark protection. In 2011 Simon Tam tried to register the name of his rock band, The Slants. The government rejected his application because “Slant” disparages Asian-Americans (watch his TedTalk, “Give Racism a Chance”). 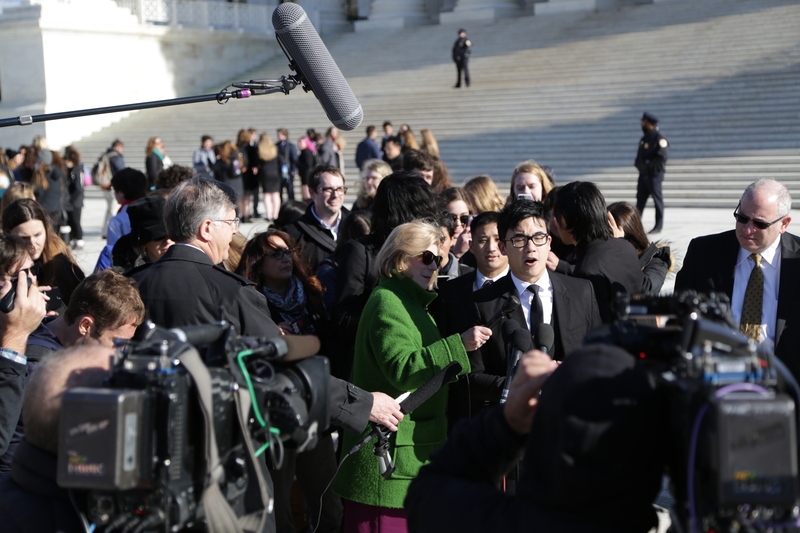 Tam, who is Asian-American, challenged the decision in court and won. The government then appealed to the Supreme Court, which heard oral argument in January 2017. For more than a decade, Becket and the federal government have fought laws banning “insulting” and “defaming” religious speech at the United Nations and in places like Pakistan, Indonesia, and Australia. These laws are widely abused to target religious minorities like Asia Bibi, the Pakistani woman sitting on death row for allegedly insulting the Prophet Mohammed. Becket filed a brief in the Supreme Court urging the government to stop excluding allegedly “disparaging” names from the federal trademark system. In December 2016, Becket told the Supreme Court that the U.S. government should practice at home what it preaches abroad: free speech for all, even speech that offends. In June 2017 the Supreme Court ruled unanimously 8-0 championing the band’s free speech. Tam was represented by Eugene Volokh and Stuart Banner of the UCLA School of Law Supreme Court Clinic, and John Connell of Archer & Grenier, P.C.